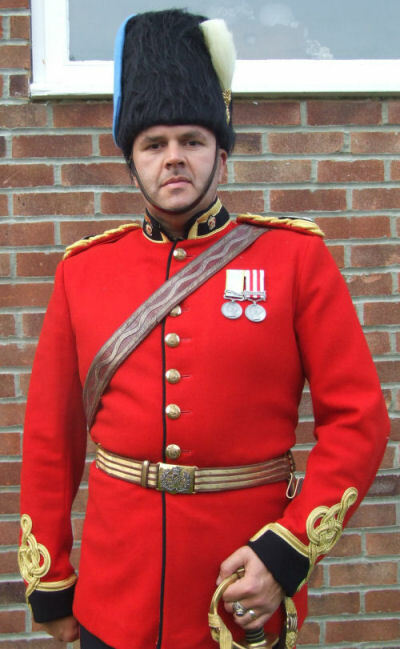 This uniform is the typical Royal Engineer Officers Dress uniform of the period. War Service: Crimea, 1854-1856; Indian Mutiny, 1857-1859. Died in London, 7-2- 1897. The Jacket started out as a modern WO2 Royal Corps of Signals Bandmasters tunic. The Epaulettes were removed and reproduction RE shoulder boards were added. The buttons have been replaced with original Victorian RE buttons. The Pouch and belt is all original, as is the sword belt. I am told that the sword belt had three gold lines up to just after the Crimea war, which is the version that I am wearing, and later had only two gold stripes which is the more commonly known version. The busby is made from scratch.